Another installment this week of the Who Cares?!!? segment. Again, you tell me which sports story you care the absolutely least about. Here we go. (1) First up, the NHL's Buffalo Sabres found themselves in an interesting predicament in San Jose last weekend and it had nothing to do with a hockey game. There are more shots featuring Sabres forward Drew Stafford on his Twitter page. 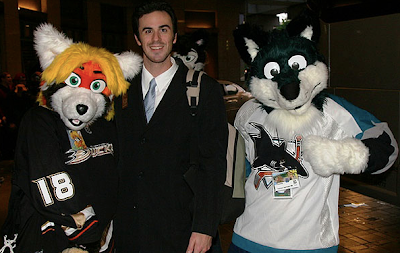 In the end, the furries may have brought the team some laughs, but not much luck. The team lost 5-2 the Sharks that night. 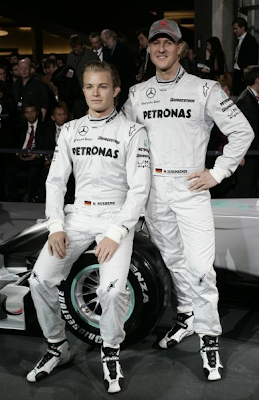 (2) Second, after a three years absence, Michael Schumacher is returning to Formula One racing with MercedesGP Racing. The forty-one year old resumes his career in a sport he dominated from 1994 to 2006 with racing teams Benetton and Ferrari. During those years he won seven Formula One championships (1994, 1995, 2000, 2001, 2002, 2003, 2004) and a total of ninety-one races. Guess who will be riding shotgun. No, not the man standing. The German joins the Stuttgart-based GP team with fellow a German, twenty-four year old driver Nic Rosberg, creating what Daimler chairman Dr. Dieter Zetsche has labeled as a de-facto "German National Team." 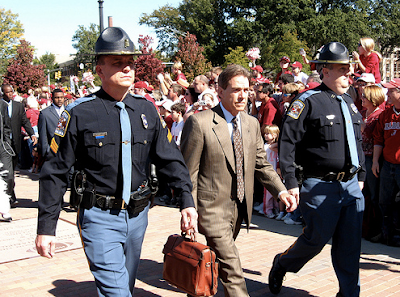 (3) Third, after becoming the school's fifth coach to win a National Championship, Nick Saban is about to become immortalized in bronze by the University of Alabama. Work has begun on a statue of the University's coach, set to cost approximately $50,000. 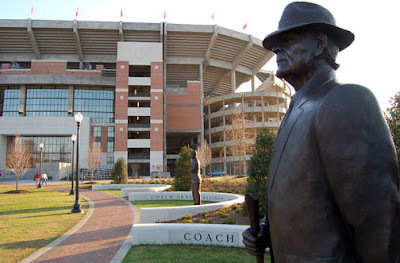 With input on the design from Saban's wife, Terry, the school hopes to have the statue in place on Bryant-Denny Stadium's Walk of Champions plaza by the spring game. (Note the spot in the first picture below where Alabama had built a place for the next coach statue...now, those are expectations). Saban's statue will join those of Alabama championship coaches Wallace Wade, Frank Thomas, Paul "Bear" Bryant, and Gene Stallings. So, tell me. What do you care least about this week?